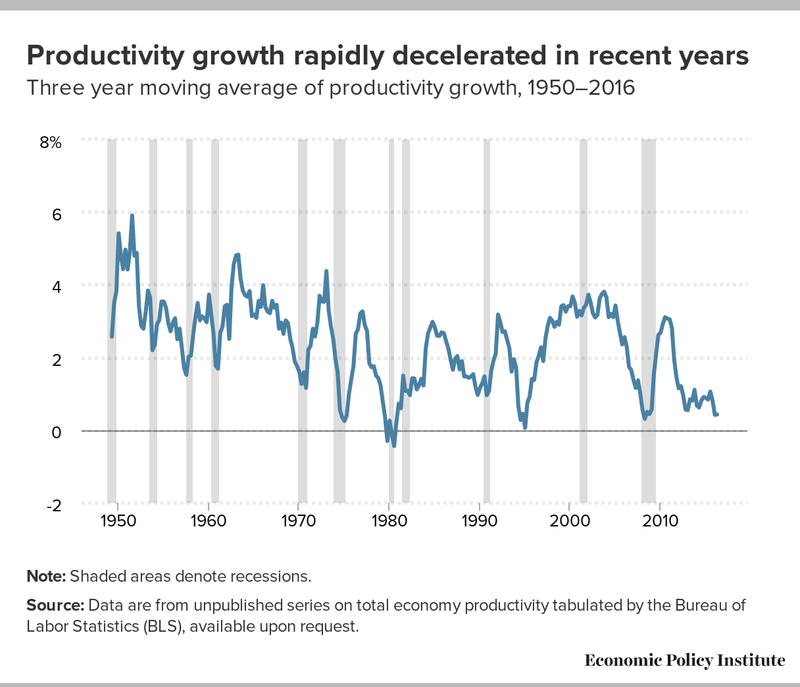 The last four years have seen an extraordinarily sharp deceleration in productivity growth (the average amount of income generated in an hour of work in the economy). In fact it has been below 1 percent for three years. This is an important trend for many reasons and it is crucially important that policymakers respond to it correctly. Taking the slow productivity growth in recent years as fixed and unchangeable would be a huge policy mistake. It would lock in weak labor markets and keep most American workers from getting the pay raises they could have gotten in a healthier economy. On the flip side, there is evidence that pushing up wages by further reducing unemployment would increase productivity as businesses gain more incentive to invest in the capital equipment and processes that make those workers more productive. The weakness in productivity growth in recent years is predominantly a function of weakness in private investment. Businesses are not investing in the equipment and technology that makes workers more productive. The main cause of the weakness in private investment is the chronic shortfall of aggregate demand (spending by households, governments, and businesses), relative to the economy’s productive capacity, lingering from the Great Recession. In other words, businesses are not investing in productivity-boosting equipment because their customers aren’t demanding enough to ensure that the existing productive capacity will be fully used. Some potential benefit to investment from less-slack demand in recent years was largely extinguished by the large fall in energy prices that led to declines in investment in extractive industries. 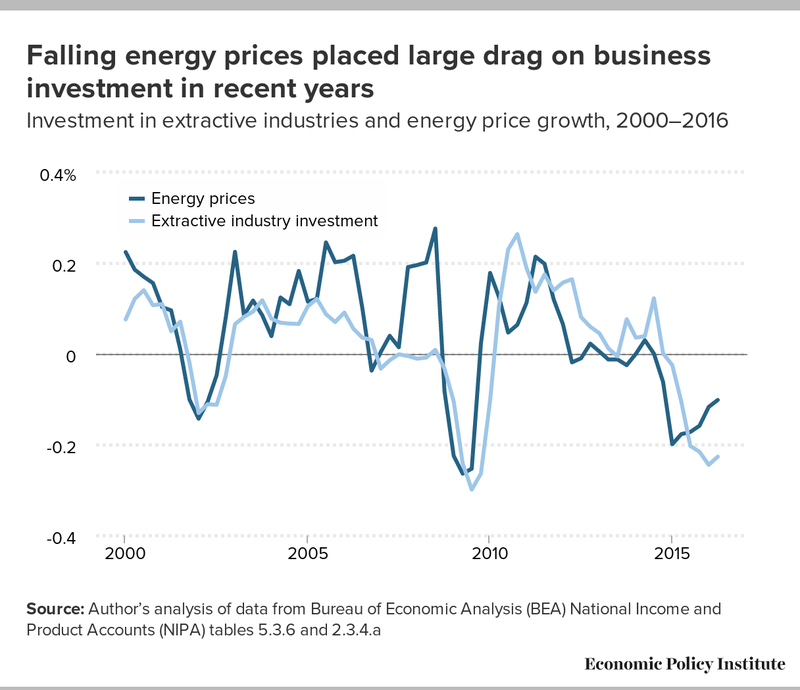 Given that these price declines have relented, low energy prices should no longer drag on business investment in coming years. The economy’s long-run potential rate of productivity growth is likely significantly higher than what the past few years of growth would indicate. The weakness in private investment that is driving low productivity growth will reverse if and when the slack in aggregate demand is taken up. Most credible forecasters, both public and private, think that trend productivity growth in the U.S. economy remains well above 1 percent annually. The confidence that trend productivity growth is higher than readings of very recent years is driven by a long empirical history of productivity growth reverting to long-run trends. This means it is a bad idea to base future projections of potential productivity growth on the very near past. If we take these last few years of productivity growth as given, this means the economy is quite close to full employment and policy should stop aiming to boost aggregate demand. This view is wrong, and potentially damaging if embraced by policymakers. If the Federal Reserve decides that the economy is indeed at full employment, it will raise interest rates in an attempt to preemptively rein in inflation. But undertaking these rate increases in the current economy—not allowing the recovery “room to run,” in Fed Chair Janet Yellen’s phrasing—could be leaving hundreds of billions of dollars in potential output unclaimed in coming years. This is particularly true if an economy given “room to run” was needed to restore decent rates of productivity growth. Similarly, if the economy is seen as at full employment by fiscal policymakers, it could lead them to underestimate the need for public investment to increase aggregate demand and to prioritize the need to reduce federal budget deficits. But an investment swing toward further fiscal austerity would reverse some of the progress we are just starting to see on wage growth for many workers (Gould 2017). A “high-pressure economy” that eliminates the remaining demand shortfall in the U.S. economy and leads to low rates of unemployment and rapid wage growth would likely induce faster productivity growth. This faster productivity growth would in turn blunt much of the potentially inflationary pressure stemming from tighter labor markets that generated faster wage-growth. Both cross-country and international studies show a correlation between rising wages and the pace of business investment. 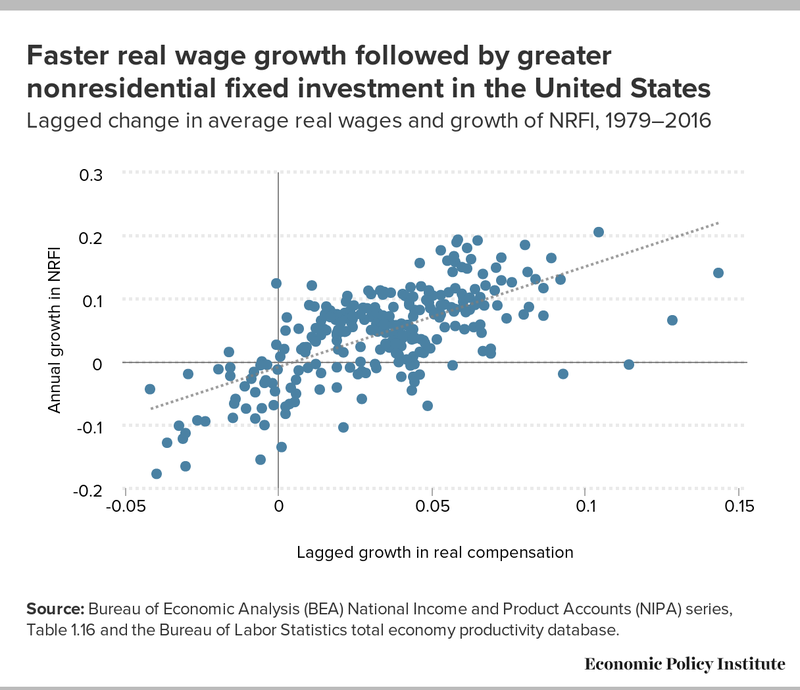 This evidence suggests that any inflationary effect of faster wage growth on prices could be significantly blunted by a corresponding increase in productivity growth as rising labor costs spur employers to boost capital investments and other drivers of productivity growth. Productivity is defined as the average income or output generated in an hour of work in the economy. This makes it the ceiling to how much average living standards can rise over the long run in an economy. It is important to note that inflation-adjusted (or real) wages and incomes for the large majority of American workers and families have risen significantly slower than economy-wide productivity growth in recent decades. This divergence between a typical worker’s pay and economy-wide productivity is the root cause of the rise in income and wage inequality over that period. The unequal distribution of the benefits of productivity growth is an extremely important issue. But even apart from the distribution issue, the rate of productivity growth remains a crucially important macroeconomic variable to track, not least because it provides an upper bound on how fast wages (both nominal and real) can rise. In the 12 months ending in December 2016, nominal (or not inflation-adjusted) hourly wages rose 2.5 percent (EPI 2017). This is a bit above the pace of nominal wage growth over most of the recovery that began in June 2009, but still far below what the growth rate should be in a healthy economy. Bivens (2014) defines a healthy-economy target for nominal wage growth as the sum of the inflation target of the Federal Reserve (2 percent) plus the trend growth of potential productivity. In that paper, it is assumed that the long-run trend in potential productivity growth is 1.5 percent. This inflation target and an assumption of 1.5 percent trend productivity growth establishes a nominal wage growth target of 3.5 percent for a healthy economy, and actually implies that a bit faster growth is needed until all slack in the labor market is wrung out. The logic is easy enough to explain. If nominal wages are growing at or beneath the rate of productivity growth, then labor costs put no upward pressure on prices at all. Say that productivity (how much output is produced in an hour of work) rises 1 percent and nominal wages rise 1 percent. What has happened to the cost of producing 1 unit of output? Nothing. Yes, firms have to pay 1 percent more for each hour of work, but they get 1 percent more output in that hour of work, so, costs per unit of output remain unchanged. And, of course, the Federal Reserve does not target zero growth in output costs (or prices), instead it targets 2 percent growth. So, adding this 2 percent price inflation target to productivity growth gives a pace of nominal wage growth consistent with labor costs putting no upward (or downward) pressure on the Fed’s price inflation target. In recent years, however, measured productivity growth has come in well below 1.5 percent. In fact, over the past three years, it has even been below 1 percent. Figure A shows the three-year moving average of productivity growth. The rapid, recent deceleration is obvious in this series (look at the big dip on the far right of the line). However, this recently poor performance of productivity should not lead us to significantly ratchet down our estimate of long-run potential productivity growth. Source: Data are from unpublished series on total economy productivity tabulated by the Bureau of Labor Statistics (BLS), available upon request. The first reason not to lower our estimate of long-run productivity growth is that productivity growth is a volatile economic data series even over a 3-year horizon. In part because of this well-known fact, very few economic forecasters have radically marked down their estimates of trend productivity growth in recent years. The Congressional Budget Office (CBO), for example, in its latest Budget and Economic Outlook (CBO 2017) estimates trend growth in potential productivity at 1.4 percent. The Goldman Sachs Global Investment Research division still estimates trend potential productivity growth at 1.5 percent (estimate not publicly available), and this is before factoring in any possibility of mismeasurement in output that could be lowering measured productivity growth. Decisions by EPI, the CBO, and Goldman Sachs to not significantly mark down forecasts for trend growth in potential productivity even though productivity growth has been weak in recent years are exactly correct. Productivity growth has historically shown a strong tendency to revert (often slowly) to very long-run averages. 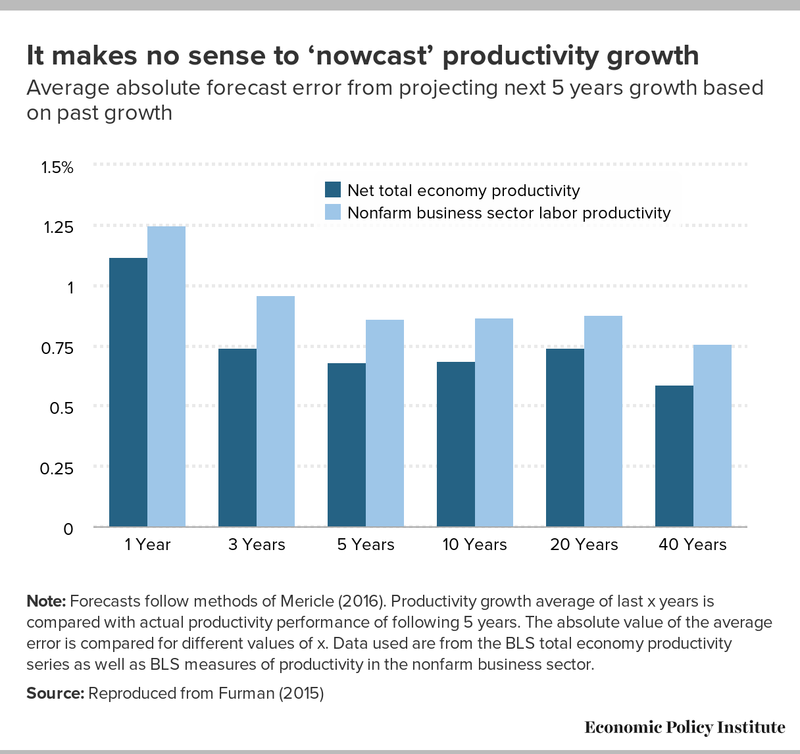 This means it is a bad idea to base future projections of potential productivity growth on the very near past—in other words, it is a mistake to “nowcast” productivity growth. Figure B reproduces a figure from Furman (2015) demonstrating that one’s forecast of future productivity is improved by using a longer, not shorter, past horizon for productivity as a predictor. For the nonfarm business sector, forecasts are improved by increasing the past horizon one examines from 1 to 3 to 5 years, and even forecasts based on the past 10, 20, and 40 years are as or more accurate than near-term forecasts (1 to 3 years). This is true for net total economy productivity as well. Net total economy productivity data, while not generated publicly by government data agencies, is a better measure of how much productivity growth can genuinely boost living standards economywide.1 If the actual trend rate of potential productivity growth is best predicted by the past 40 years of data rather than the past year or two, this argues that projections of potential productivity growth in the nonfarm business sector should be closer to 1.8 percent. Note: Forecasts follow methods of Mericle (2016). Productivity growth average of last x years is compared with actual productivity performance of following 5 years. The absolute value of the average error is compared for different values of x. Data used are from the BLS total economy productivity series as well as BLS measures of productivity in the nonfarm business sector. Further, one does not have to search that hard for reasons why the last 5 years might be particularly uninformative for projecting future productivity growth. The fingerprints of demand-side slack holding back productivity growth are all over the data, so, as this slack relents, there is every reason to think that longer-term trends will reassert themselves. The clearest sign that demand-side weakness is holding back productivity growth can be seen when one decomposes productivity growth into its constituent parts. Productivity growth is the result of three influences: labor quality upgrading, capital deepening, and total factor productivity (TFP) growth. Labor quality upgrading measures the contribution of a smarter, more experienced, and more educated labor force to productivity growth over time. Capital deepening measures the contribution of investments in plant and equipment that give workers better tools to perform their jobs. Total factor productivity growth measures how much output rises holding all other inputs (labor and capital) constant. Its long-run change is frequently interpreted as a sign of technological advance. Figure C compares the contribution of each of these influences to productivity growth in recent years with their contributions in earlier economic periods. The contribution to productivity growth stemming from capital deepening has fallen dramatically in the post-2012 period. This in turn reflects the slow rate of business investment following the Great Recession. 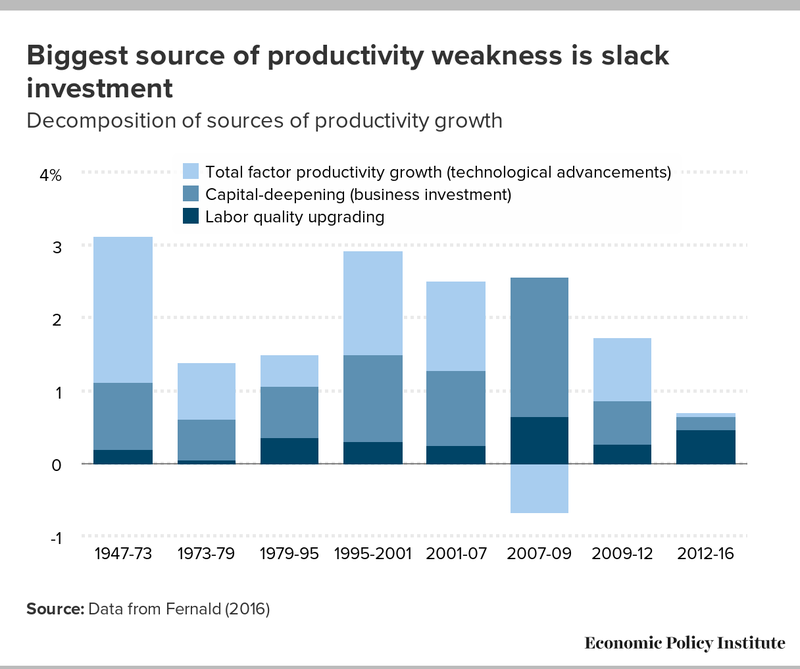 If capital deepening’s contribution to productivity growth reverted to the 1979–2007 average (not shown), then this would boost productivity growth going forward by roughly 0.7 percent relative to what it has been since 2012. This would go a long way to closing the gap between very recent productivity trends and long-run averages. The decline in the contribution of total factor productivity growth is slightly larger than the decline in capital deepening when compared with long-run averages. While TFP growth is harder to explain generally, there is widespread agreement that it is also a function of investments, most notably investment in research and development. Given this, it seems likely that part of the extraordinary weakness in TFP growth since 2012 is also a casualty of the dearth of investment. A natural question that arises is why investment growth remains so weak more than seven years into recovery from the Great Recession. One obvious answer is that it is economic slack, not time, that should be expected to boost investment. Given the historically sharp and long contraction of economic activity during the Great Recession, and given the historically slow pace of recovery, it seems plausible that businesses still do not feel that they need to substantially boost capacity in order to meet projected demand. 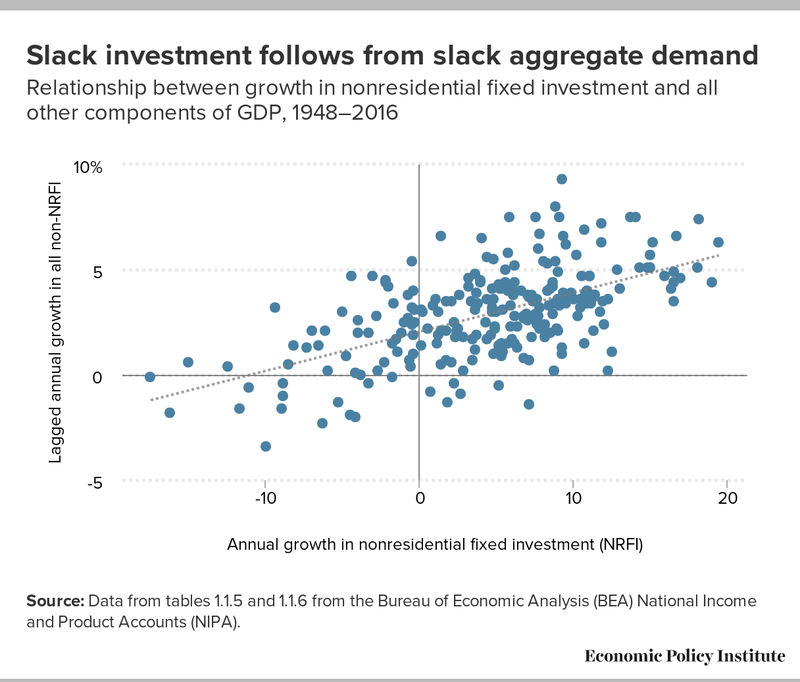 How can we be sure that the slow pace of business investment in the wake of the Great Recession is evidence of demand-slack holding back productivity growth? For one, research has long highlighted the importance of the “accelerator” effect on business investment: the most important determinant of investment growth is simply the pace of economic growth generally. Figure D shows growth in nonresidential fixed investment (NRFI) and growth in the trailing four-quarter average of gross domestic product minus NRFI. Essentially, this measures how much demand strength outside of NRFI leads to more-rapid NRFI growth in the coming year. The correlation is clear and economically significant. Source: Data from tables 1.1.5 and 1.1.6 from the Bureau of Economic Analysis (BEA) National Income and Product Accounts (NIPA). Some hopeful signs on investment? Although investment growth remains weak, there is some evidence that it could improve in the near future. Figure E shows a measure of capital services per “effective hour worked” in the economy. “Effective hours of work” is a measure that accounts for growth in total factor productivity and upgrades in labor quality. Specifically, effective hours of work equals total hours worked plus the growth of labor quality plus the growth in total factor productivity. The ratio of capital per effective hour worked is a measure of how much businesses need to invest to keep pace with the growing productivity of their workforces. If investment lags below this pace, then the scarcity of capital will drive up its price, and will produce a rise in the share of business sector income claimed by capital owners. This rise in the return to capital investment should induce new businesses to enter production and push the return to capital back down to normal levels. 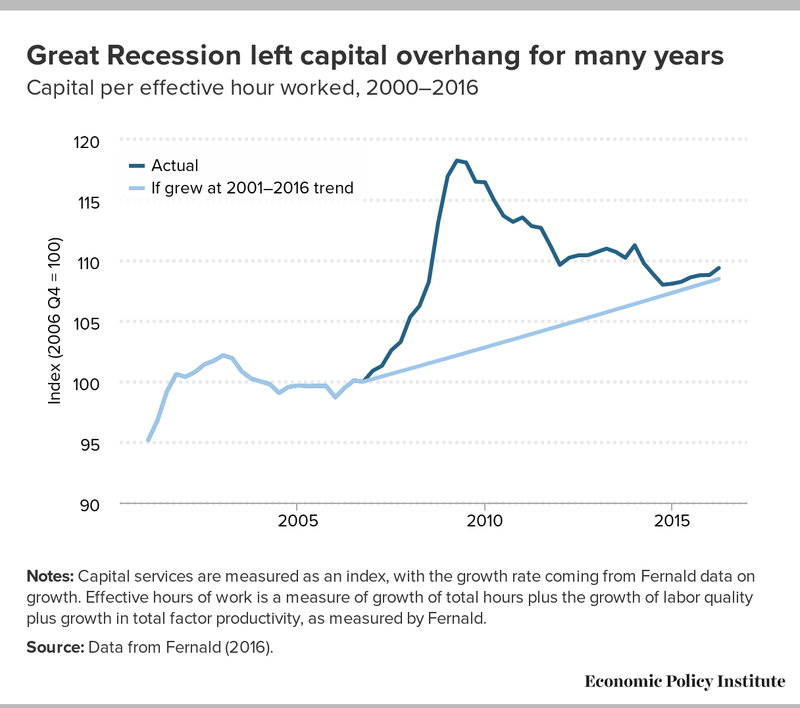 This capital-to-effective labor ratio ballooned in the Great Recession and slow recovery, as job losses shoved down the denominator. Notes: Capital services are measured as an index, with the growth rate coming from Fernald data on growth. Effective hours of work is a measure of growth of total hours plus the growth of labor quality plus growth in total factor productivity, as measured by Fernald. Source: Data from Fernald (2016). To the degree that changes in the capital income share are strictly cyclical, this share should normalize as recovery proceeds and investment picks up (spurred by businesses responding to higher profit rates and shares). So far in the recovery from the Great Recession, this general pattern has held: while recovery has been slow, each incremental improvement in the wider economy (a decline in the unemployment rate, for example) has been accompanied by a narrowing of the gap between pre–recession and current profit shares in the corporate sector. Importantly, the trend in this measure over the course of the previous labor market recovery indicates that the U.S. economy is now at the point where new investments will have to be made in order to keep this measure growing. In short, one could say that there was a capital “overhang” due to the Great Recession: businesses in preceding years had undertaken expansion of plant and equipment forecasting a given level of demand, but because demand contracted sharply, they were left with excess plant and equipment for years relative to their effective labor force. Even as sales and hiring picked back up as recovery began, it still took a substantial amount of time to work off this capital overhang. If the pattern shown by Figure E holds, we may be near to turning this corner and businesses may be induced into more investment. One instructive part of this graph is that the actual pace of investment over the past six quarters has actually matched the growth of investment between 2001 and 2006. The real abnormally slow period of investment that can be seen in the recovery of 2009 and beyond is in mid-2014 and through mid-2015, when investment fell. But this anomaly is not that hard to explain; it was driven largely by sharp reductions in the price of energy goods, which in turn reduced investment in extractive industries. Figure F charts investment in extractive industries against energy price growth. As energy prices begin falling, investment craters. When energy prices rise, investment recovers. Once energy price decline stabilized in 2016, the fall in investment stopped. Going forward, it seems highly likely that investments in extractive industries will stop pulling down the overall average investment rate, and some faster recovery can be expected. Finally, another hopeful sign about the coming years is that the normalization of capital-to-effective hours ratio has occurred even with after-tax profit rates at historically elevated levels. Figure G shows pre– and post-tax profit rates for the nonfinancial corporate sector. While these rates have come down a bit in recent years off of the historic highs reached earlier in the current recovery, they remain substantially above the long-run average. Note: Profit rate is calculated by dividing net operating surplus by the current stock of fixed assets for the nonfinancial corporate sector. Evidence that much of the drought in investment in recent years can be laid at the feet of slack demand can be found as well in Blanchard and Leigh (2013) and Fatas and Summers (2015). Blanchard and Leigh (2013) suggest a clever empirical test of how clearly exogenous (i.e., policy-driven) demand shocks can impact economic performance: they look at the forecast error of growth in gross domestic product (GDP) as a function of government budget-tightening. They find that actual GDP growth significantly underperformed forecast GDP growth in 2011 and 2012 in those countries that undertook larger degrees of fiscal austerity in 2009 and 2010. Fatas and Summers (2015) extend the Blanchard and Leigh (2013) results to see how persistent was the damage to economic growth from a negative demand shock (again, imposition of policy-driven reductions in government spending or increases in taxes). Their answer is that it is very persistent: austerity undertaken in 2009 and 2010 is strongly negatively associated with cumulative economic growth through 2014, and even affects measures of potential output through 2019. Blanchard and Leigh (2013) also find that the damage done by austerity is disproportionately borne by investment spending. The growth slowdown driven by austerity is twice as large for investment spending as for overall GDP. Figure H shows that this investment effect looks quite persistent as well. The figure plots the cumulative forecast error for gross fixed capital formation (GFCF) between 2010 and 2015 against the change in structural government balances in 2009 and 2010 for a sample of 20 countries. The cumulative forecast error for GFCF is a measure of how much actual investment rose or fell relative to the forecast change. The results show a large (and statistically significant) negative relationship: countries that targeted larger increases in government balances (i.e., either raised taxes or cut spending) saw much slower investment growth relative to pre-austerity forecasts. Again, a negative demand shock drags on investment for a long time. 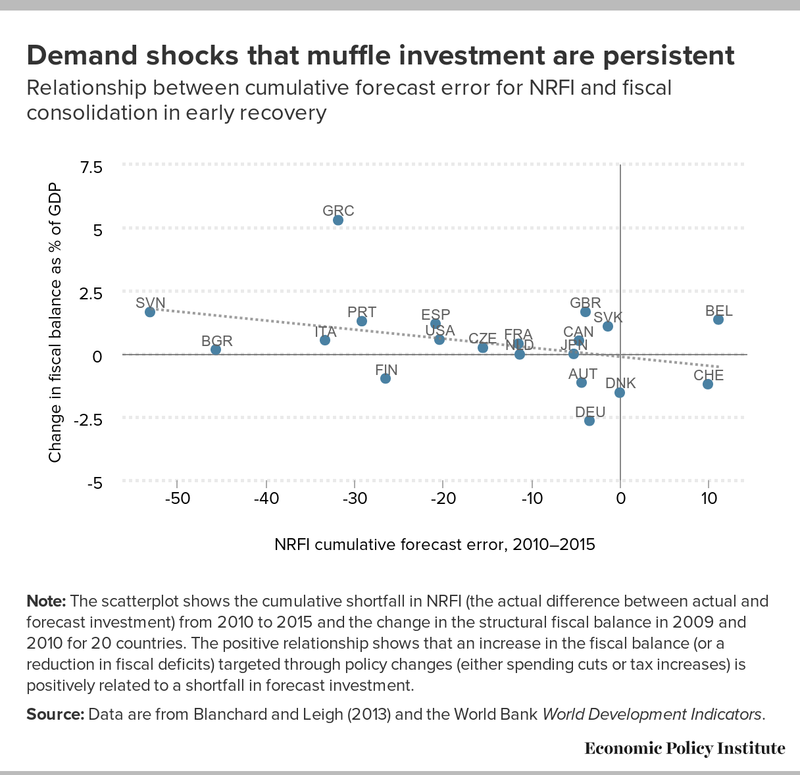 Note: The scatterplot shows the cumulative shortfall in NRFI (the actual difference between actual and forecast investment) from 2010 to 2015 and the change in the structural fiscal balance in 2009 and 2010 for 20 countries. The positive relationship shows that an increase in the fiscal balance (or a reduction in fiscal deficits) targeted through policy changes (either spending cuts or tax increases) is positively related to a shortfall in forecast investment. Source: Data are from Blanchard and Leigh (2013) and the World Bank World Development Indicators. Hein and Tarassow (2010) use a panel of six countries (Austria, Germany, France, Netherlands, the United Kingdom, and the United States) over 1960-2007 and find positive and significant effects of rising labor costs on productivity growth. They similarly find positive and significant impacts of a rising labor share of total income on productivity growth. Their empirical results indicate that each 1 percent increase in labor cost growth increases productivity by roughly 0.3 percent. This implies that rising labor costs come with a built-in offset to overall price pressure as they induce faster productivity growth. 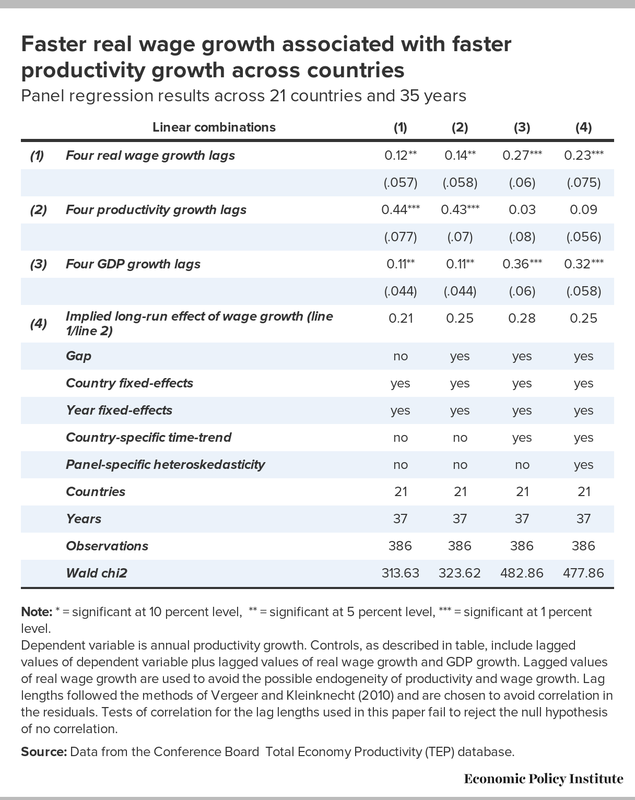 Vergeer and Kleinknecht (2010) use a panel of 19 countries from the Organization of Economic Cooperation and Development (OECD) from 1960–2004 and find very similar effects of rising labor costs on productivity growth (0.31-0.39 percent rise in productivity following a 1 percent rise in real wages). Figure I shows a simple scatterplot of annual productivity growth versus annual growth in real compensation lagged one year for 21 OECD countries across the 1980–2015 period. The slight (though statistically significant) upward slope remains even after a number of controls are added. Source: Data are from the Conference Board Total Economy Productivity series. Note: * = significant at 10 percent level, ** = significant at 5 percent level, *** = significant at 1 percent level. Dependent variable is annual productivity growth. Controls, as described in table, include lagged values of dependent variable plus lagged values of real wage growth and GDP growth. 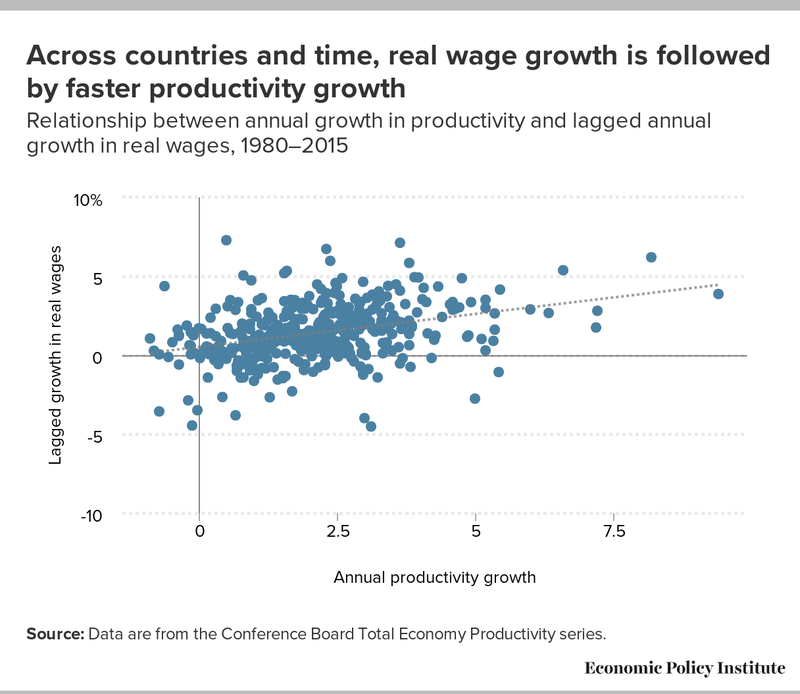 Lagged values of real wage growth are used to avoid the possible endogeneity of productivity and wage growth. Lag lengths followed the methods of Vergeer and Kleinknecht (2010) and are chosen to avoid correlation in the residuals. Tests of correlation for the lag lengths used in this paper fail to reject the null hypothesis of no correlation. Source: Data from the Conference Board Total Economy Productivity (TEP) database. The table shows the combined effects of four lags of real wage growth on annual productivity growth. The long-run effect of real wage growth is calculated by summing coefficients on the real wage lags and dividing by the annual productivity change not accounted for by simple autoregression in productivity growth. In each regression specification, the linear combination of the four real wage lags is statistically significant, and the long-run effect is consistently between 0.25 and 0.3. This is firmly in line with the previous Vergeer and Kleinknecht (2010) findings and implies that a 1 percentage-point rise in the pace of wage growth would be accompanied by a 0.25 to 0.3 percentage-point increase in productivity growth. Finally, we examine the behavior of aggregate investment in the United States and potential links to rising real compensation growth. Figure J shows year-over-year changes in nonresidential fixed investment and lagged year-over-year changes in real compensation costs. The bivariate relationship is statistically and economically significant. Source: Bureau of Economic Analysis (BEA) National Income and Product Accounts (NIPA) series, Table 1.16 and the Bureau of Labor Statistics total economy productivity database. This relationship persists in a regression that includes controls for a number of other influences. Table 2 shows the results of a regression using year-over-year growth in NRFI as the dependent variable. Other controls include lagged values of NRFI growth, lagged values of other components of aggregate demand, lagged real wage growth, the capital-to-labor ratio, a number of components of the cost of capital, and the corporate financing gap (a measure of how easily firms could finance new investments out of their own internal resources). In specifications not including the financing gap and the capital-to-labor ratio, the coefficients on lagged real wage growth are not statistically significant. But as these variables are added, the size of the coefficient increases and it becomes statistically significant. Dependent variable is the year-over-year growth rate of non residential fixed investment (NRFI). Controls include lagged values of NRFI, acceleration in growth of gross domestic product (GDP) and capital–to–labor ratio. Controls also include components of the user cost-of-capital: short-term interest rates, long-term interest rates, and the relative price of capital goods relative to other production in the economy. Controls for the ability of corporations to internally finance investment (the financing gap and the liquid share of short-term assets) are also included. We choose lag lengths to insure no autocorrelation in the residuals. Source: Data are from the Bureau of Economic Analysis (BEA) National Income and Product Accounts (NIPA), the Bureau of Labor Statistics (BLS) nonfarm business productivity series, and the Federal Reserve. Our preferred specification is the final one, which includes controls for lagged NRFI, lagged acceleration in domestic demand and exports, lagged variables describing the cost of capital, a time dummy, a measure of the corporate financing gap (how much of current planned investment by firms could be financed out of internal savings), and a measure of the capital-to-labor ratio. The coefficient on lagged real wage growth in this regression is 0.67 and is statistically significant. This implies that a 1 percentage-point increase in the growth rate of real wages would boost NRFI by 0.67 percent. In the longer run, the effect rises to nearly 2 once one accounts for the autocorrelation of NRFI investment. 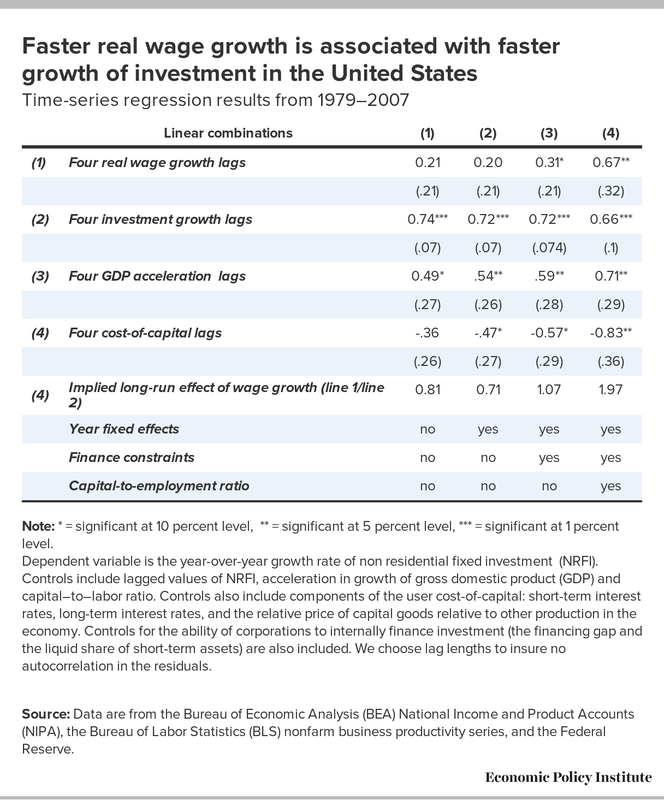 Given the crucial importance of capital deepening in any recovery of productivity growth, and given that capital deepening is driven by investment decisions, this evidence suggests that when the U.S. economy finally sees robust wage growth, it will likely be followed by a substantial pick-up in productivity growth. The casualties of the Great Recession and subsequent slow recovery have been many. The most important are obviously those workers and families that have suffered from the loss of jobs and declining wages and incomes. But another casualty of the Great Recession is a deceleration of productivity growth. Given that productivity growth provides the ceiling on how fast potential living standards can rise, it is crucially important to not accept a lower rate of productivity growth if it can be fixed by policy. And one key driver of slow productivity growth in recent years can be fixed: the remaining shortfall between aggregate demand and the economy’s productive potential. Running the economy far below potential for a long time has led to insufficient investment to sustain rapid productivity growth. One way to close this accumulated investment gap is, of course, to simply have fiscal policymakers boost public investment. And this should indeed be a response. But another crucial response is to ensure that the labor market and wider economy run hot enough to force businesses to boost investment simply to meet growing demand. When this is done, policymakers also need to keep the recovery strong until real wages begin consistently rising. From a policy perspective this means keeping interest rates low and not prematurely raising them due to misguided fears of inflation. The inflationary impact of a pick-up in real wages is likely to be quite muffled by the faster investment and productivity growth that will follow. As with all macroeconomic predictions, this one about productivity rising to meet wage growth could be wrong. But the downside risk of being wrong is relatively small; a couple of years of above-target price inflation as wages push up costs. Given the many years of below-target inflation, one hesitates to even call this a “downside” of a policy that has the economy going for growth. The downside risk of reining in demand before we even test the virtuous cycle of rising wages leading to rising productivity growth, however, is enormous. The decline in potential output for 2017 between what was forecast in 2007 and what is estimated now is almost $2 trillion. If half of this—$1 trillion—could be clawed back through a policy that runs the economy hot and leads to higher productivity growth, it will be an extraordinarily consequential policy choice. We use three regression analyses in this paper. The first replicates the tests of Fatas and Summers (2015) on the persistent impact of fiscal consolidation (increasing the government’s structural budget balance) on economic growth. We then use investment, rather than overall gross domestic product (GDP), as our dependent variable. The data come from the Blanchard and Leigh (2013) extract from the IMF World Economic Outlook from 2010 (IMF 2010). In this version of the World Economic Outlook, the IMF forecasts a number of variables five years ahead. We then use actual data on investment from the World Bank’s World Development Indicators database to compare actual versus forecast nonresidential fixed investment between 2010 and 2015. We then correlate the difference between actual and forecast investment (or, the “forecast error”) with the change in the structural fiscal balance in 2009 and 2010. As the scatterplot in Figure H shows, there is a systematic association between fiscal consolidation (cutting spending or raising taxes) and a large, negative forecast error. Following Blanchard and Leigh (2013) and Fatas and Summers (2015), we interpret this association as the causal effect of an exogenous shock (a clear policy decision to cut budget deficits) on subsequent investment growth. We picked the countries to include in our sample to match the Fatas and Summers (2015) sample. The second regression analysis is based on panel data consisting of 21 advanced countries over the 1980-2015 period. The data includes the Conference Board’s Total Economy Productivity (TEP) database. The TEP includes data on labor productivity growth, output, employment, total hours, and total compensation. We undertook this regression to assess whether or not the results found by Vergeer and Kleinknecht (2010) held with more up-to-date data. In each case the dependent variable is the average annual change in productivity. Our baseline regression uses lags of the dependent variable, GDP growth, and year and country-specific fixed-effects as controls. Four lags of real wage growth are used as dependent variables as well. For lagged variables, the coefficient and standard errors of the linear combination of all lags are reported in Table 1. The real wage growth is entered with lags to avoid endogeneity problems in correlating with productivity growth. 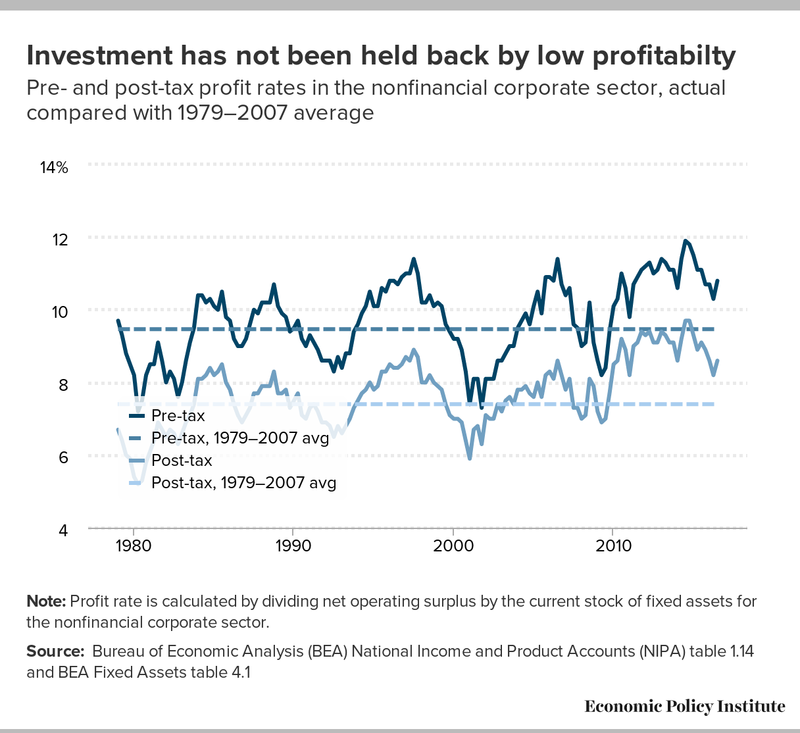 Also, given that a prime mechanism through which firms may boost productivity in response to rapid labor cost growth is investment in either capital equipment or better processes (which would boost total factor productivity growth), it makes sense that such investment comes online only after some lag. We follow the guidance of Vergeer and Kleinknecht (2010) in choosing lags based on eliminating serial correlation in our results. Including four lags leads to a failure to reject the hypothesis of no serial correlation in the residuals. Other versions of the regression include country-specific time trends, a variable measuring how far a country’s productivity level is from the United States, and a regression that allows for panel-specific heteroskedasticity. The coefficient on lagged real wage growth is consistently statistically significant in all regression specifications, and in the one with all controls is economically significant as well. We follow Hein and Tarassow (2010) in expressing the long-run effect of lagged real wage growth as summing up the coefficients on these and dividing by one minus the summed coefficients of the lagged endogenous variables. While the precise estimate of the coefficients on lagged real wage growth changes with decisions on lags, and its statistical significance is often outside conventional levels, the estimated coefficient (or sum of coefficients) is uniformly positive. Further, the pattern is clear that adding lags from 1 to 4 monotonically increases the estimated sum of coefficients. Given the general difficulty in establishing durable estimating relationships from cross-country macroeconomic panel data, the positive influence of real wage growth on productivity strikes us as durable. A final regression analysis, based loosely on specifications used by Tevlin and Whelan (2000), uses quarterly macroeconomic data from the United States since 1979. We undertook this to assess the impact of rising wages on the pace of investment. The dependent variable in this regression is year-over-year growth in nonresidential fixed investment from the Bureau of Economic Analysis National Income and Product Accounts data. Control variables include lagged dependent variables, lagged year-over-year changes in growth rates for all elements of foreign and domestic demand besides NRFI, variables that influence the cost of capital investment to firms (the effective federal funds rate, which is a short-term interest rate controlled by the Federal Reserve; the interest rate on 10-year Treasury bonds; and the relative price of capital goods), measures of internal corporate financing capability (the “financing gap,” which is a computation of capital expenditures minus corporate profits, and the share of all assets held in short-term liquid forms), measure of the ratio of the aggregate capital stock to overall employment (the capital-to-labor ratio), and year fixed-effects. We again use four lags on each variable, but since we are now using quarterly data, this implies a much shorter effect. We again follow the Vergeer and Kleinknecht (2010) standard of including lags until there is no evidence of serial correlation. Further, we use the year-long lag to account for previous studies’ findings that the effects of some influences on investment (interest rates, for example) take this long to filter through into changes in investment trends. When not including controls on internal financing constraints or year fixed-effects, the sum of coefficients on real compensation growth is statistically insignificant. However, in the preferred specification in which controls for internal financing, year fixed-effects, and the current capital-to-labor ratio are included, the sum of lagged real wage coefficients become statistically and economically significant. Further, when these lags are included the sum of lagged dependent variable coefficients becomes economically trivial and statistically insignificant. This implies that the long-run impact of faster real wage growth for increases in NRFI is considerable, with each 1 percentage-point increase in wage growth translating over time into a 2 percentage-point increase in the growth rate of NRFI. We should also note that the estimated effect of the cost of capital on aggregate investment also increases in both economic and statistical significance as further controls are added. 1. For more on net, economy–wide productivity, see Bivens and Mishel (2015). 2. Key examples of a theoretical treatment of this include Bhaduri (2003), Dutt (2006), Barbosa-Filho (2004) , and Barbosa-Filho and Taylor (2006). 3. Some more details about the data and methods used in regression analyses in this paper can be found in the appendix. Barbosa-Filho, Nelson. 2004. “A Simple Model of Demand-Led Growth and Income Distribution.” Working Paper. Institute of Economics, Federal University of Rio de Janeiro, Brazil. Barbosa-Filho, Nelson, and Lance Taylor. 2006. “Distributive and Demand Cycles in the U.S. Economy: A Structuralist Goodwin Model.” Metroeconomica, vol. 57, no. 3, 289–411. Bhaduri, Amit. 2003. “Alternative Approaches to Endogenous Growth.” Working Paper. Jawaharlal Nehru University, India. Bivens, Josh. 2014. A Vital Dashboard Indicator for Monetary Policy: Nominal Wage Targets. Policy Futures Project, Center for Budget and Policy Priorities. Bivens, Josh, and Lawrence Mishel. 2015. Understanding the Historic Divergence between Productivity and a Typical Worker’s Pay: Why It Matters and Why It’s Real. Economic Policy Institute. Blanchard, Olivier, and Daniel Leigh. 2013. “Growth Forecast Errors and Fiscal Multipliers.” Working Paper. International Monetary Fund. Bureau of Economic Analysis (BEA). Fixed Assets Tables. Various years. Fixed Asset Tables 4.1. Bureau of Economic Analysis (BEA). National Income and Product Accounts (NIPA). Various years. National Income and Product Accounts Tables [data tables]. Conference Board. 2016. Total Economy Productivity (TEP) database, November 2016. Congressional Budget Office (CBO). 2017. Budget and Economic Outlook, 2017 to 2027. Dutt, Amitava. 2006. “Aggregate Demand, Aggregate Supply and Economic Growth.” International Review of Applied Economics, vol. 20, no. 3, 319–336. Economic Policy Institute (EPI). 2017. “Nominal Wage Tracker.” Updated February 17. Fatas, Antonio, and Lawrence Summers. 2015. “The Permanent Effects of Fiscal Consolidations.” Discussion Paper, Centre for Economic Policy Research. Federal Reserve. 2016. “H.15 Release on Selected Interest Rates.” Accessed December 2016. Fernald, John. 2016. “A Quarterly, Utilization-Adjusted Series on Total Factor Productivity.” Federal Reserve Bank of San Francisco Working Paper 2012-19, updated December 2016. Furman, Jason. 2015. “Productivity Growth in the Advanced Economies: The Past, the Present, and Lessons for the Future.” Speech given at Peterson Institute for International Economics, Washington, D.C., July 9. Gould, Elise. 2017. The State of American Wages 2016: Lower Unemployment Finally Helps Working People Make Up Some Lost Ground on Wages. Economic Policy Institute report. International Monetary Fund (IMF). 2010. World Economic Outlook Database 2010. Mericle, David. 2016. “Trend Productivity Growth: 2% Still Seems about Right.” Goldman-Sachs U.S. Daily (unpublished email), November. Tevlin, Stacey, and Karl Whelan. 2000. “Explaining the Investment Boom of the 1990s.” Working Paper. Federal Reserve Board. Vergeer, Robert, and Alfred Kleinknecht. 2010. “Jobs versus Productivity: The Causal Link from Wages to Labour Productivity Growth.” TU Delft Working Paper. World Bank. Various years. World Development Indicators.